As soon as I saw the chance to sit down and play a few rounds of the winner of the prestigious board game award “Kennerspiel des Jahres”, I had to take the opportunity. 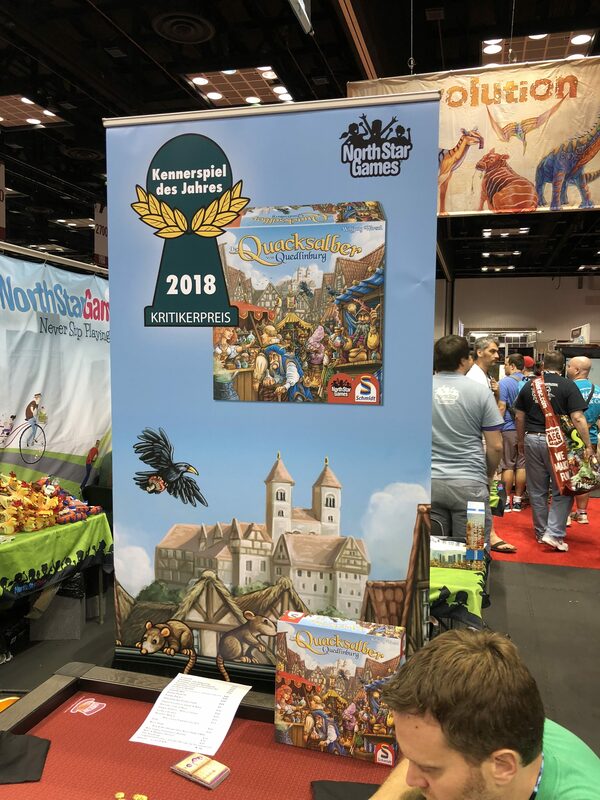 Die Quacksalber Von Quedlinburg, by North Star Games, is roughly translated to mean the Quack of Quedlinburg, which is what I am told the English translation will be when released. Quack, in this instance not meaning what a duck says, but a goofy, clumsy, or imitation doctor. As players, we are playing doctors, placing ingredients into our pots and trying to create some kind of clever creation. Basically, you start with a large amount of white tokens in your bag and a few other colors. White tokens are bad and if you pull out of your bag a certain number of these during a round your pot will explode and you get a penalty. Each token also has a number on it and when placed in your pot you move forward that many spaces further on the track that gets you money. At the end of each round you receive money based on how far you got on the track and can buy new tokens that aren’t white (won’t blow you up) and have higher numbers to get you further on the track next round. I enjoyed the play through I was lucky to have and will definitely be on the look out for the future release of this game in English, which is set to happen in November 2018.